Is this a stand alone system? What would I need to make this a PA system? BEST ANSWER: This could be considered a stand alone system if you only need 2 microphones as it has a small built in mixer, if you need more than 2 microphones you would need a separate mixer - but not a powered mixer as the unit has its own amplifier built in. To use as a PA system you would only need microphones and mic cables to connect and possibly a stand for the unit to get it off of the floor. Yes, this is stand alone system provided you add a microphone & mic cable. You simply plug an XLR microphone & cable into the input, plug the speaker into power and you have your PA system. If you want to add a second speaker you run a separate XLR cable between the two. This is a stand alone system. The speaker and power amp are one unit. So this would be all you need. One note, with only one speaker it would be a mono PA not a stereo PA. If you want stereo, you need to buy two of these and probably a mixer. Yes, it can work as a standalone pa system for a small venue or rehearsal. It can handle 3 separate inputs (mics or instruments). You'll need appropriate instrument and microphone cables and/or microphones, and a speaker stand. Can you plug in three 1/4 instrument cables at once? BEST ANSWER: Maybe, I don't have my speakers here with me right now but from what I remember from the last time I used them there are 3 inputs- depending. If you are looking to plug in 3 guitars it might get a little weird impedance wise. The first 1/4" input is made to favor hiz guitar type signal, the other 2 not so much and are dependent on switch settings as well. There is also the question of balanced vs. unbalanced 1/4"- if you don't know the difference you might want to consult a trained professional before purchasing to avoid disappointment. I am very happy with the sound quality of these speakers but I don't use the built in mixer often. Hope this helps. Yes. It has 3 inputs, 1 is 1/4" TRS only and the other 2 are "combo jacks" (1/4" TRS+XLR). What class of amplifier powers these speakers? Class A, AB, D, Etc? 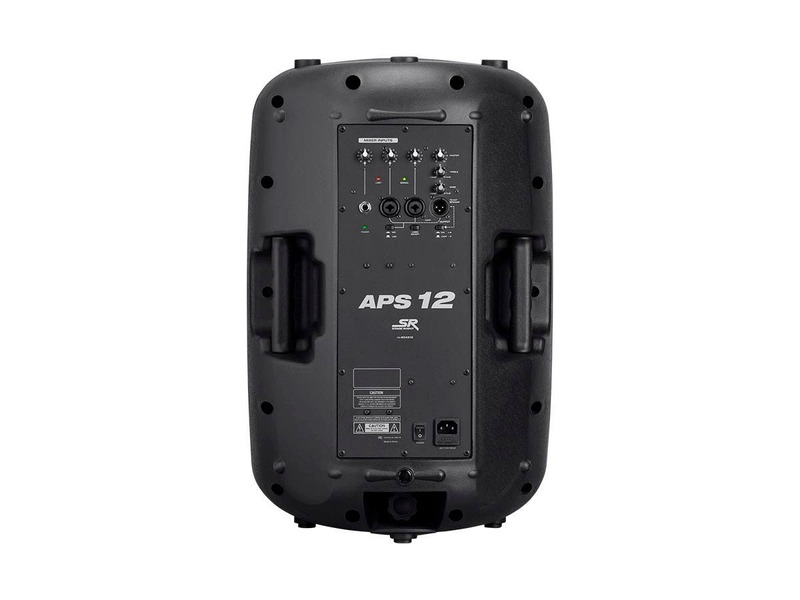 BEST ANSWER: The APS series speakers are powered by Class D amps. BEST ANSWER: Thanks for your interest in our Active PA Speaker. The manual states the Treble is ±12db @ 10kHz and the Bass is ±12db @ 100Hz. The manual states that this speaker only consumes 16W, is this correct? BEST ANSWER: Thank you for your interest in this speaker. The APS only consumes 16W at idle. Max consumption is 425W at full power. Thank you for bringing up this issue. We will revise specs and manual. How is your max SPL calculated? You list a sensitivity of 102 dB @ 1m which is really good. One would expect that a 400W speaker of that sensitivity would produce a much higher SPL at reasonable distances. 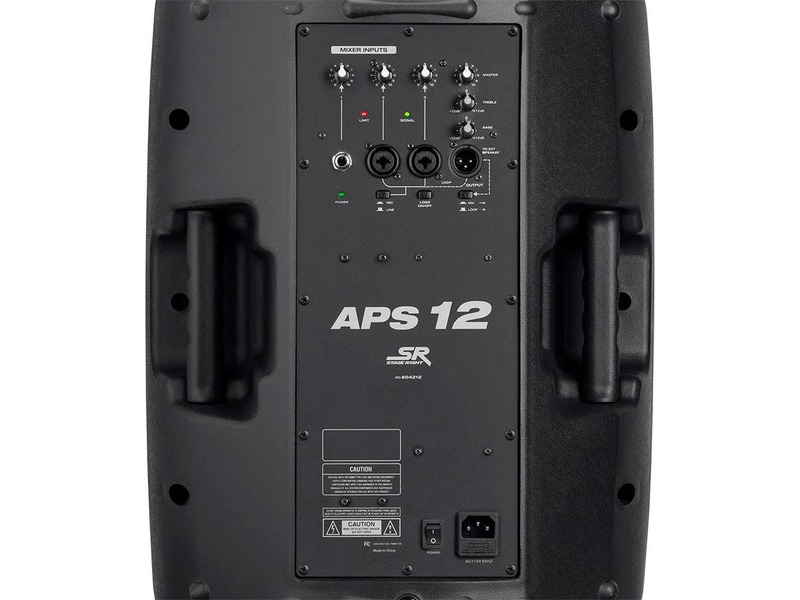 BEST ANSWER: Thank you for your interest in the portable PA. Max SPL is 126db. We will work on correcting the product page specs. Thank you. How are these compared to the 150 watt bi amplifies model for movie playback? Which would be better/louder? 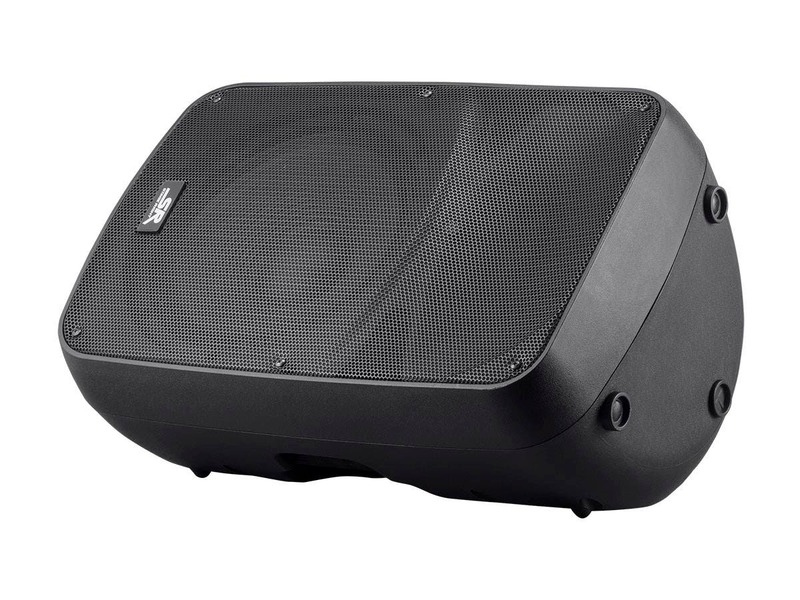 BEST ANSWER: The 400w is plenty loud but you NEED a subwoofer as they do not go very low. With a sub they sound great! BEST ANSWER: The logo button is suppose to turn the front logo back light on/off. 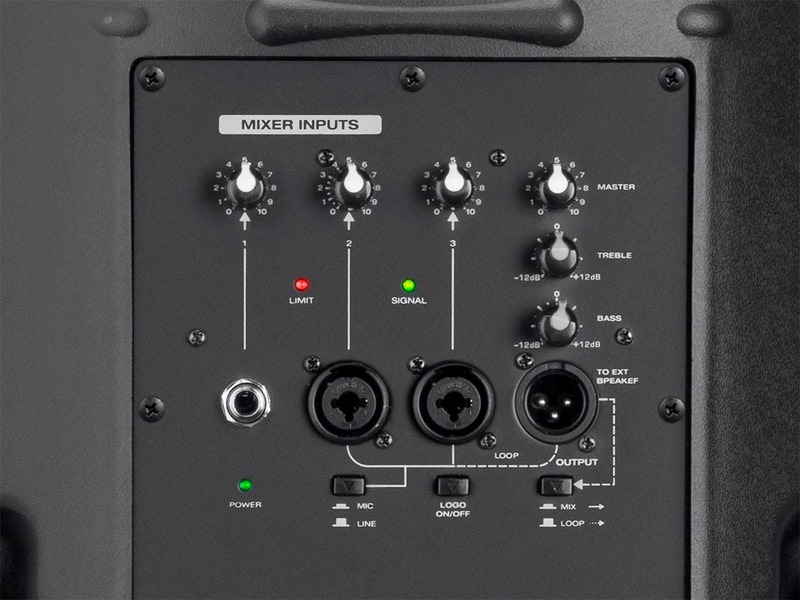 MIX (button pushed in) allows sound that you hear from the speaker to pass as line level out the balanced XLR to daisy-chain the to another powered speaker. LOOP (button out) routes just inputs 2 & 3 to the XLR. This is usefull for professional musicians to mix their own instruments in to their own amp then send that signal to the house mix. Great sounding PA speakers at a fantastic price. I use these speakers every week and they sound great with plenty of power to fill a hall with a 300 person capacity. The tweeter is a bit bright but a small adjustment on the treble and they warm right up. Nice power/weight ratio. I will recommend them to anyone looking for a great value in a PA speaker. Good value speaker that has a nice amount of functionality. Two things of note:The power switch doesn't appear to do anything. Switching it in either direction the speaker is still active.The power cord is a little hard to push in. I bought two and the second one I must not have pushed it in far enough because I blew the fuse right away. Luckily it comes with a spare so I was able to get it working again right away. Great sound and clarity. Better than a more expensive one with the same specs. I bought this speaker to cover a wedding ceremony that I was doing for 200 people. I tried to buy 2, but they were sold out. Anyways, I used just the one and it more than filled up the room with sound and voice just fine. When available, I will definitely buy another one. So far so good... I grabbed four of these to use as floor monitors for our classic rock band. They sound great and really cut through well. The only issue so far is that one of the units died after 30 minutes. Fortunately that was during rehearsal. A quick trip to the web site and it was on its way back for replacement. A new one showed up 3 days later. I've never had a problem with Monoprice standing behind their gear, in fact its one of the reasons I buy from them. As long as I don't have any more issues, I'm sold on these things. The unit I just received (12" version) has improperly installed treble and bass controls (rotated 90 degrees counterclockwise), and the logo light does not turn on. I wouldn't want the logo lit up anyway, but the rotated EQ controls are annoying. I purchased two of the 10" units several months ago and they are perfect. I purchased two APS-12s in November of 2017. Initially they seemed quite good. They presented a clear, flat response at high volume levels. I used one as a stage monitor/amp for my guitar along with an amp modeler/multi FX unit for a club gig. It worked wonderfully. Then I used both as a mains PA for a small live gig, running them at moderate volume. Within 15 minutes, one of the two APS-12s stopped working. I continued my set with just one APS-12, and occasionally tried turning the other on. No luck - it was dead for the entire gig. But when I brought them home and tested them the next day, they both worked. Wary of relying on them, I labeled them #1 (good so far) and #2 (unreliable). I then took them to my studio and set them up with my CD player. Over the course of a couple of weeks, #1 continued to work while #2 would shut off intermittently. Sometimes it would come on after a half-hour's rest, sometimes it would remain dead until the next day. Please note that these units were never pushed beyond moderate volume levels, they never exhibited any distortion, nor was there any apparent overheating, no blown fuses, no smell of burning components. I used unit #1 once again for a low-volume live gig, and it worked fine - EXCEPT the front pilot light died. Back at my studio, #2 continued to function intermittently, so I put it aside and continued to use #1 for low-volume guitar applications. Today, #1 shut down. I let it sit for about a half-hour, and it has come back on, but I cannot begin to imagine using either of these units on a regular basis. I will explore returning them to Monoprice, but I certainly won't be paying any money for shipping costs. I may have purchased a collection of parts. 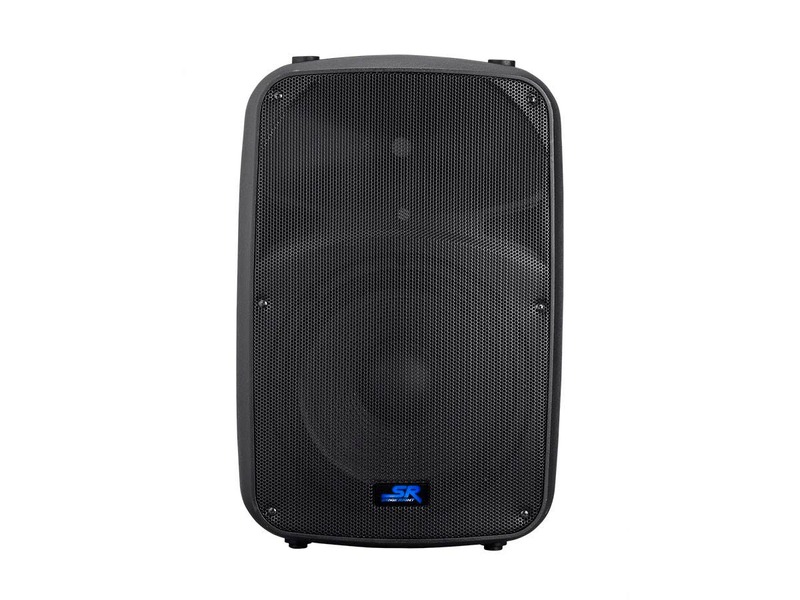 I bought one of these as a back up speaker to the pair of Active powered speakers that I use for my DJ business, the first weekend, I had to put it into service immediately for a wedding ceremony and had my other pair set up at a different part of the venue. The speaker was basically plug and play, had more than enough clear volume for the music and the for the ceremony and all speaking, it was clear and loud enough and did not get too hot. It was summer and heat is always a concern doing any outdoor gigs. Fast forward another week, and I used it as a 3rd speaker as an extension for an outdoor gig where I was blasting music for 4 hours straight. The speaker bailed me out not just the first weekend but again the 2nd week. Easy to use, the sound was actually impressive. I was completely impressed at how well it held up, the volume was great (I purchased a 12") and didnt expect crazy amounts of bass, like far too many people expect when they buy these 10 or 12 inch speakers.. I set it to what I thought was a good eq setting and blasted music, it didnt peak out too easy, didnt distort, I found the setting that I could push it without it clipping and the speaker did wonderful for the whole event. It is lightweight and easy to lift onto a speaker stand. it sounded great, but I wasnt expecting it to sound like a $1200 speaker, but I will say that it our performs many budget active speakers on the market that begin with the letter B and have a yellow triangle in their logo. They are a good solid choice if you are on a budget, or if you need some speakers for speaking engagements and such, pair them up with subs and you will have a great system that sounds like you spent many hundreds of dollars more. my only complaints would be in the design, the knobs are not protected so they can be easily damaged in transport, if they were recessed it would be much better and I wish Monoprice sold a protective bag case for them to transport./ Sound quality for speech and music was way beyond expectations and easily manageable with a little EQ tweeking. There are definitely much worse sounding speakers on the market that cost a whole lot more. I ran these for the entire summer and into the fall untill Halloween and not once did it fail on me and it bailed me out of a few jams. well worth the monty and honestly sounds like they cost more. If you want a good solid speaker that wont break your wallet, these are an excellent choice. I plan on purchasing another 12 inch and a pair of 15's to use. :ike I said, they sound like a much more expensive mid level powered speaker. fix the issues with the control knobs on the rear, get them protected more and you have a solid winner here. thanks Monoprice, you continue to amaze me with the value and quality f the products I buy thru you. I have bought speakers, cables, lighting, cell phone accessories, and many other products, very rarely have I had a problem with anything, and if there was an issue the customer service was outstanding. 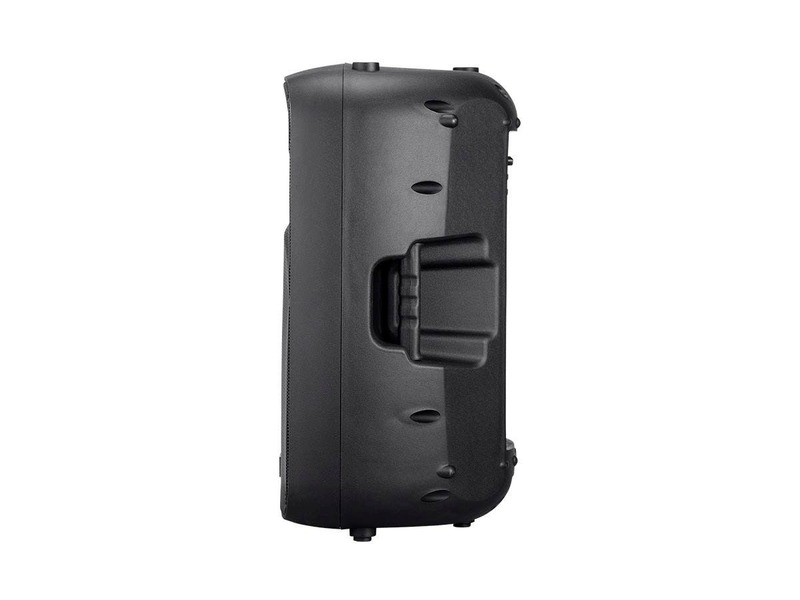 How about getting some carrying bags protective cases for these speakers and you will have a home run! !